One of the most interesting, unique, and perhaps divisive flavors in all of spirits is “hogo.” Hogo is Creole slang for “haut gout” (a French term for “high taste”) and its most closely associated with the funky characteristic that is identified with many Jamaican rums. Describing hogo (that Jamaican funk) is not easy (it’s easier experienced than described) but you can think of a rotting or overripe element ranging from blackened bananas to spoiled red meat. The mystique behind hogo is full of unsubstantiated, misleading rumors (like the use of goat heads or dead bats), but the science is more about long pot-still fermentation, the careful use of leftover dunder (or muck), and the creation of esters that impart the funky hogo characteristics. Billed as “the world’s top-selling overproof premium white rum,” this inexpensive ($20-25) Jamaican staple reportedly accounts for 90% of all rum sales on the island. Nose: Raw dry-aged ribeye, fresh roast corn, and the raw alcohol of 126-proof unaged rum. Palate: Crisp apple, pineapple, fresh cut grass, and alcohol heat. Finish: Short and sharp with more subtle guava and pineapple notes. Between the proof and the youth, I wouldn’t recommend this as a rum to sip neat, but it can shine in a cocktail. It’s not for everyone, but I love it in a funky traditional daiquiri and it’s an obvious candidate for tiki drinks. This 57% ABV “navy proof” rum is a mix of two of Hampden’s distillation styles (Wedderburn and Plummer) mixed together after 1 to 3 years of aging. Expect to pay around $30 for a bottle. Nose: Brown banana peel, oak, and brown sugar. Palate: Crisp tropical fruit (pineapple and mango) followed by clove, molasses, sugar cookies, and ginger with an oily mouthfeel. Finish: Long and lush with tobacco, nutmeg, burnt caramel, and a hint of powdered chocolate. Many will probably reserve Smith and Cross for cocktails, but think it’s quite enjoyable neat. Try it that way or on the rocks, but if 114-proof is too intense for you, I especially like the funky notes swapped in for gin in a classic negroni recipe. Assuming you are using Wray & Nephew in cocktails (especially sweet tiki concoctions), you can pretty much pick out any cigar you like, with the general rule that the stronger the flavors, the more full-bodied the cigar. 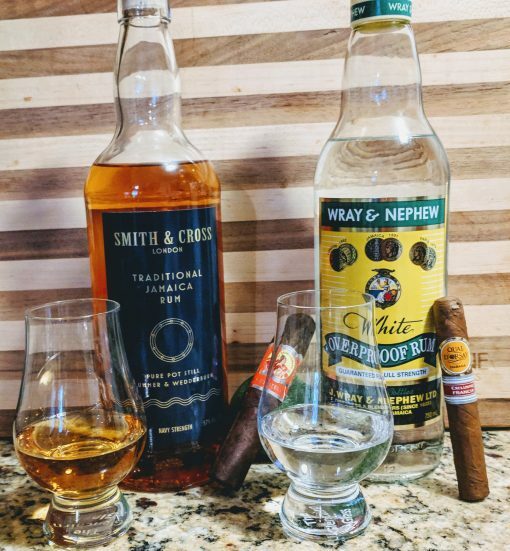 Smith and Cross deserves to be enjoyed neat (or with a drop of water or an ice cube or two) and with an earthy, full-bodied cigar like the Padrón Serie 1926, Tatuaje Havana VI Verocu, or Dunbarton Tobacco & Trust Umbagog. Ahead of both bourbon or rye, you could make the argument that apple brandy is the original American spirit. It turns out Johnny Appleseed, whose story you likely heard in grade school, was planting apples that were likely good for little except turning into apple cider, brandy or applejack (which is created by mixing brandy-neutral grain spirits). But apple brandy was hardly an American invention. For at least 400 years, the Normandy region of has been distilling apples (sometimes along with pears) into calvados brandy. Today I’m tasting two calvados brandies, both aged for at least 15 years. Details: Aged more than 15 years in oak casks. Bottled at 40% ABV. $41 per bottle. Nose: Pear, baking spices, and brown sugar. Palate: Honey, walnut, brioche, and leather. Finish: Soft and long with pie crust, leather, and oak. Details: Aged in 200-year-old casks for 15 year calvados, this one bottled at 42% ABV. $55 per bottle. Nose: Fresh tart apple, tannins, and oak. Palate: Floral notes with clove, sandlewood, citrus, and sherry. Finish: Oak, sour apple, and spice. Both of these brandies showcase why I’ve become a fan of of calvados. While very different, each showcases both the fruit and wood from age. The Morin is more full-bodied and fruit-forward, while the Menorval is more restrained with softer fruit flavors and more wood influence. 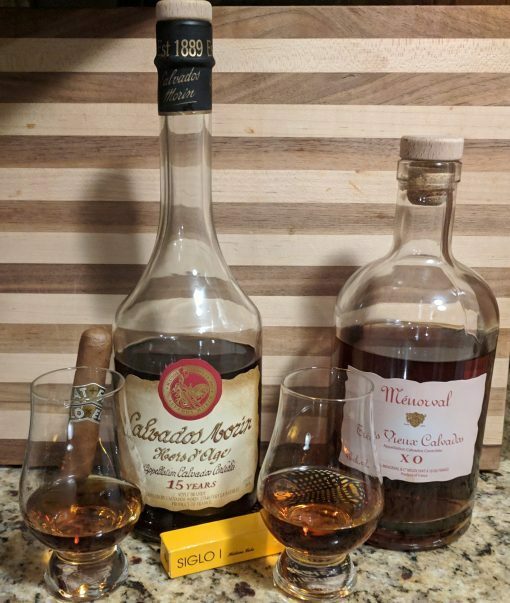 I’m not sure either calvados could stand up to a full-bodied cigar without being overpowered, but a well-balanced medium-bodied cigar is an excellent pairing. Recommended cigars include the Illusione Rothchildes CT, Paul Garmirian Reserva Exclusiva, Tatuaje Black, and Davidoff Colorado Claro. In this edition of Cigar Spirits, I’m looking at three wheated bourbons from three different states: West Virginia, Florida, and Kentucky. All bourbons must be made with a mashbill that’s a majority corn, but what sets a wheated bourbon apart is that wheat (and not rye) is the secondary grain. Generally, with age, wheated bourbons, including highly sought-after bourbons like Pappy Van Winkle and W.L. Weller, are considered sweeter and less spicy than their more numerous rye counterparts. Smooth Ambler has bottled well-received bourbon and ryes sourced from other distilleries for years under their Old Scout line. Big Level is the first bourbon produced at their West Virginia distillery. Specs: Aged at least five years, bottled at 100-proof, and made from a mashbill that is 71% corn, 21% wheat, and 8% malted Barley. Batch 21. Price = $55. Nose: Charred oak, menthol, and a touch of alcohol heat. Palate: Caramel, cinnamon spice, malted milk, cherries, and burnt corn. Finish: Pepper and green oak. Verdict: Youthful and unique. Tasty now, but still with an edge that could be smoothed out with more barrel time. Cigar pairing: Best smoked with a spicy Dominican like the Fuente Opus X or La Flor Dominicana Double Ligero. Not that long ago, you could count the number of whiskey distilleries in the United States in the dozens; now that figure is well over 1,000. St. Augustine Distillery is one of the many new craft distilleries. Unlike many new operations, St. Augustine isn’t sourcing whiskey from elsewhere. Instead, it’s producing an in-house Florida-made bourbon. Specs: This special edition 102-proof “malted bourbon” is sold only at the gift shop. It’s made by taking St. Augustine’s Florida Double Cask Bourbon (distilled from corn, wheat, malted barley, and aged first in half-size 25-gallon barrels, then full-size 53-gallon barrels) then aged further in barrels that were used to make port at the nearby San Sebastian winery. Price = $40 for 375 ml. Nose: Clove, fruitcake, honey, and oak. Palate: Leather, cereal grains, and cherries. Finish: Tannins, oak, white pepper, and grains. Verdict: There is a lot going on with this bourbon, including a delicious nose. It’s a gutsy product from a craft distiller, though you’d be unable to miss the youthfulness, which creates a slightly harsh edge. I’d be really interested to try St. Augustine bourbon with four or even six years in the barrel. Cigar pairing: Spicy Honduran cigars like the Camacho Corojo, H. Upmann Yargüera, or CLE. The storied Rebel Yell brand has been around for decades and is known for wheated bourbon. The brand started at the famed Stitzel-Weller distillery, home of bourbon like Weller, Van Winkle, and Old Fitzgerald. The brand is owned by Missouri-based Luxco, but reportedly the bourbon is now produced on contract at Heaven Hill, with the 10 year Single Barrel variety being the top offering in the line. Specs: 100-proof single barrel Kentucky wheated bourbon. Barrel #5083223; distilled in September 2006. Price = $65. Nose: Vanilla, caramel, dried fruit, and orange peel. Palate: Roasted pecans, shortbread, oak, burnt sugar, and cinnamon. Finish: Lingering vanilla, wood spice, and pie crust. Verdict: A rich, surprisingly spicy bourbon with a long finish. Unlike the other bourbons in this tasting, this is an integrated finished product, not just a promising work in progress. 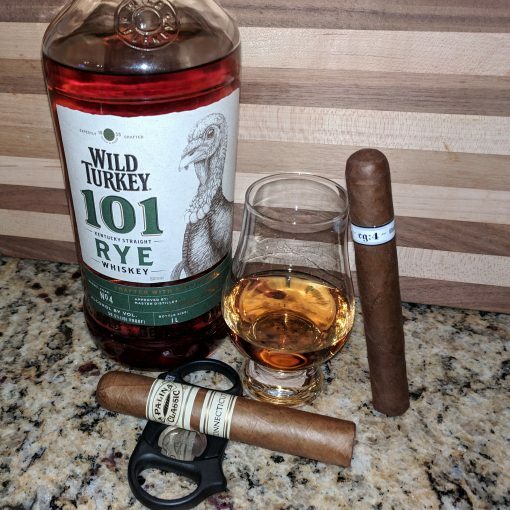 Cigar pairing: Balanced, medium-bodied, Connecticut-wrapped cigars like the Illusione Rothchildes CT, Cabaiguan, or Drew Estate Herrera Esteli. 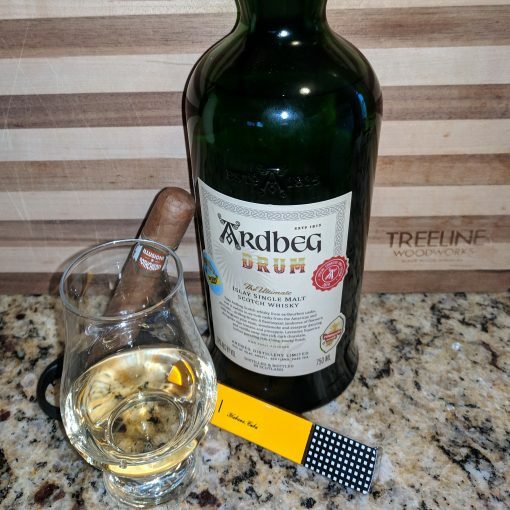 In the 28th edition of our Random Thoughts from the Humidor series, I talk cocktails, calvados, and the FDA. Here’s a winter cocktail that may sound strange but is actually quite enjoyable. When you think of daiquiris, you think of tropical islands. Not peaty Islay whiskey. Yet, recently, I’ve found myself enjoying this Islay twist on a classic drink. The smoky, salty scotch is magical with the citrus, similar to a margarita made with a smoky mezcal. 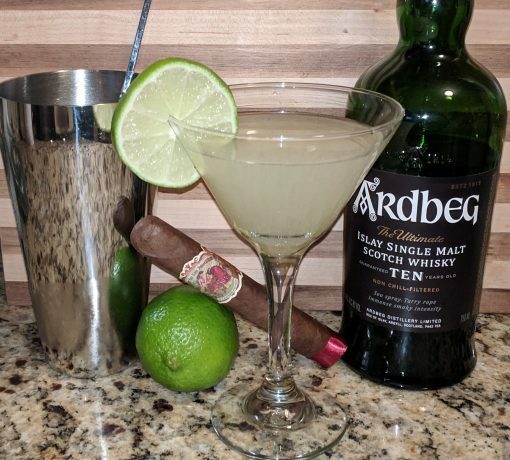 Simply swap in 10 year Ardbeg or Laphroaig for rum in your favorite daiquiri recipe. No progress at the FDA? By pressing the pause button on the Obama FDA’s cigar regulations, new leadership at the FDA was welcomed by many in the handmade cigar industry. Nearly two years later, it is time to look at the new regime’s policy. This article argues recent FDA moves signal a dangerous future for adults who choose to smoke cigars: “[T]hese moves may pave the way for even more radical regulations that would, in essence, make it illegal to sell the combustible tobacco products favored by cigarette and cigar smokers throughout the United States.” What is clear is that Scott Gottlieb’s reign at the FDA may have different priorities from the Obama Administration, but different isn’t necessarily significantly better. Is Calvados the Next Big Thing? I’ve been exploring calvados lately. I’m liking what I’m tasting. The apple (and sometimes pear) brandy from Normandy combines some of the best elements of cognac, wine, and whiskey. Terroir matters, oak barrel aging is important, and both large and small producers develop their own distinct styles. Give it a try. If you have any favorites, let us know. Haven’t finished your Christmas gift list? StogieGuys.com is here to help with some bourbon, rye, and single malt gift suggestions. Plus, an accessory any whiskey drinker would appreciate. Lots of people like whiskey, but with so many choices and lots of hype it’s hard to decide what makes the best gift. Prices are going up and whiskeys that were once easy to find are now impossible to find (at least at retail). Fact is, it’s not just ultra-limited whiskeys like Pappy Van Winkle that cannot be found without paying an exorbitant price. 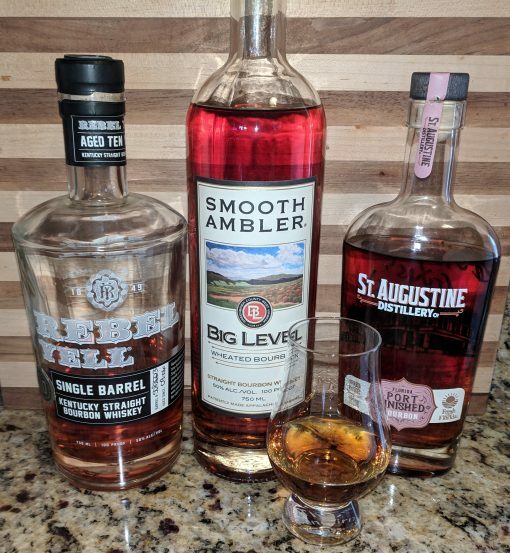 Even such staple bourbons as Elmer T. Lee, Weller 12, and Blanton’s are becoming hard to find. With that in mind, here are suggestions focused on whiskey you can actually find and buy. 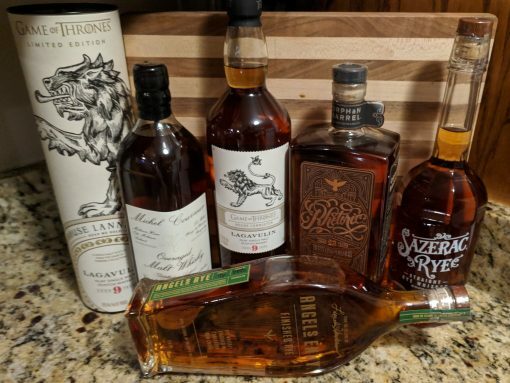 For each category, we’ve got a suggestion that is value-priced ($20 to $30), something a bit nicer and more expensive ($35 to $60), and a whiskey that, while not too difficult to find, is, for one reason or another, rare or limited. Value: Buffalo Trace — A standard offering from the maker of Pappy, Blanton’s, Eagle Rare, and many more highly sought-after bourbons. It’s delivers a lot of flavor for around $25 that’s excellent neat but not so expensive that you’d cringe if you use it in a cocktail. Superior: Four Roses Single Barrel or Booker’s Barrel Proof — Two different offerings depending on the recipient. Four Roses Single Barrel ($45) is a rich, spicy offering. Booker’s ($60) is a powerful, full-flavored, barrel-proof offering. Rare: Rhetoric 25 — The sixth and final edition of the Rhetoric annual release, which started out with the 20-year-old edition and concludes with this year’s 25-year-old release. It shows off the increasing effects of time spent in a bourbon barrel. Intense and perhaps even overly woody for some, this bourbon will be hard to find when it hits retailer shelves later this month at $150. Superior: Sazerac — This six-year-old rye is a classic that would be appreciated as a gift by any rye fan who isn’t a snob. It’s got classic floral and spice flavors, all for just $36. Rare: Angel’s Envy — The rum barrel finish of this rye gives it an exotic, sweet finish. Think rye crossed with Sauternes or oloroso sherry. At $75 to $90, it is a special occasion whiskey, and a generous gift. Value: Monkey Shoulder — Not blended whisky (which uses grain whisky), but a smooth, fruity blend of three single malts. It’s $25 to $30, but it offers the quality of a single malt at half the price. Superior: Talisker Storm or Glendronach 12 — Talkisker Storm ($50) is smoky and peaty with balance and sweetness. For the peat-adverse drinker, Glendronach 12 ($60) is about as intensely sherried in style as a single malt gets. Glencairn Whisky Glasses — Any whiskey drinker will appreciate the gold standard in whisky glassware. It is designed to bring out the best in bourbon, rye, and single malt (and also works well with brandy or rum). Even if your recipient already has a few of these, more is always better. A good collection will let them taste side-by-side, or host a tasting with friends.